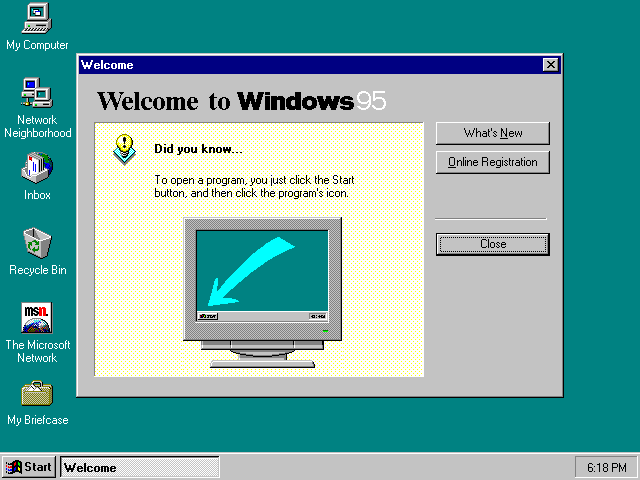 I rebuild a 486 PC with some spare parts, and because it had 32MB RAM, I thought it would be a good idea to install Windows 95... YES, this first rolling stones ("start me up") driven meanwhile ancient operating system. Unfortunately I didn't have an IDE CD-ROM yet available for it, so I decided to recreate the floppy disks for installing Windows 95 from my Windows 95 CD-ROM (using my modern PC). This was not so easy ... while googling for it, I found a lot of hints about Windows 95B (OSR2) installation, also describing how and what to copy onto the floppy disks, but hey, Windows 95 (first edition, 4.00.950) differs here totally ! Infos I found about a "WIN95_02.CAB" file were misleading - there is not such a file for the first edition. There is also no need to format floppy disks in DMF format here. At least 30 minutes later, the base installation was finished. What I didn't knew before - the video card was an ET3000 and Windows 95 did not recognized this, but you can surprisingly install drivers also from Windows 3.1 (there were no Windows 95 driver for the Tseng ET3000). Now I was even able to set 256 colors (instead of the default 16 colors). Next project for me: Installing the first Diablo game (from Blizzard)... stay tuned. Looking for the Pecan UCSD Pascal / p-system disks (which can't be found for download in the Internet), I digged out two disk images while visiting an almost unknown forum. Because the images were in IMD format, I had to unpack them first with IMDU before I can try it with a virtual PC (VMware Workstation etc). But the images were not usable (or seems to be not usable). 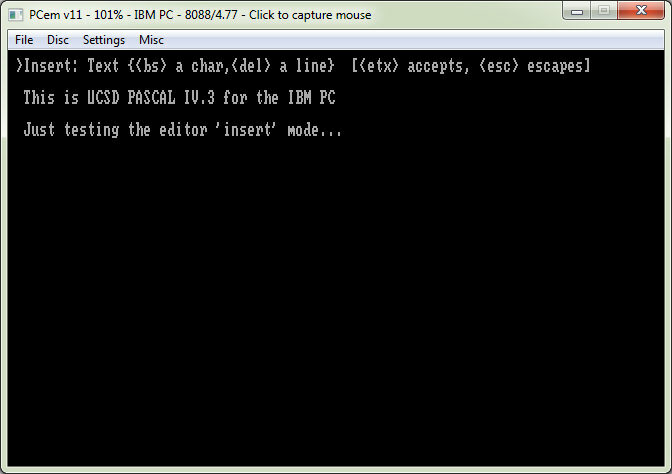 But I didn't stop trying and I also took PCem for it, and while choosing an "IBM PC" for emulation, it suddenly works (it stops booting for about 10 secs, but went on working, showing the start menu selection !). 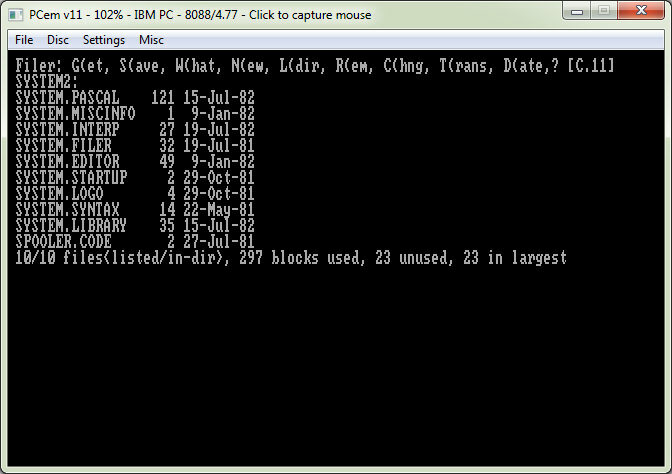 So the first learning was, it does ONLY run on 8088/8086, not on a later Intel CPU (like 286, 386 a.s.o). The disk images are in RAW format, and have a structure of 40 tracks, single sided, 8 sectors/track. Not sure if this can be changed to an other disk format, because you have to change the p-System code also. See related link for the attached ZIP file with the disk images. P.S. : I have also a page for UCSD software, see >here<. 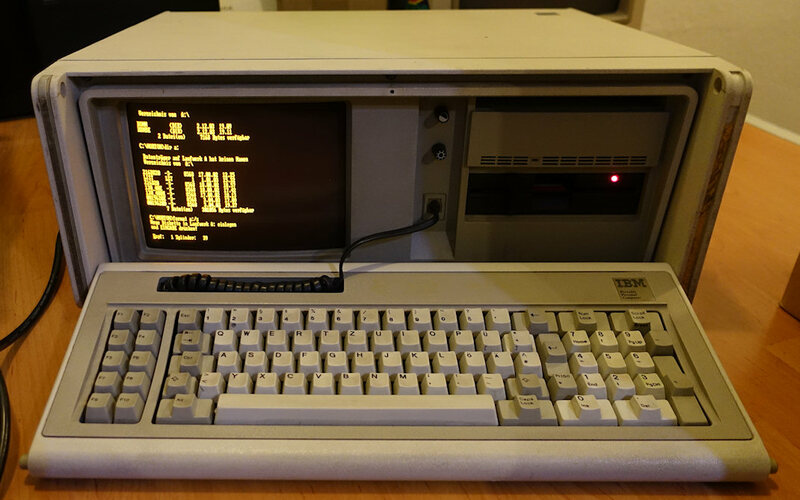 Promised, this is the last entry about the (beautiful) IBM Portable PC 5155. I replaced my original, really long CGA card with an ATI EGA Wonder (first series). And I was surprised how good many EGA capable games are looking. Also, 640x200x16 (EGA high res with 200 lines) is also possible with the build in CGA composite monitor of the IBM Portable PC. Unfortunately the original software floppy disks can't be found anymore, I only found the "SMS.COM" video mode switching program for DOS. 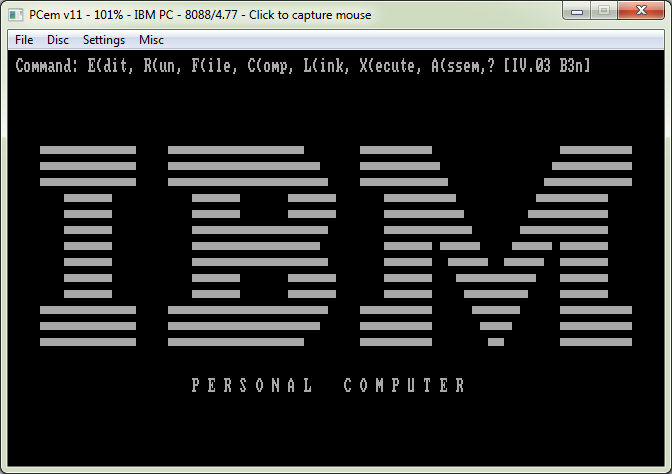 To show PCX images, I used 2SHOW (CompuShow 2000, runs on a plan IBM PC/XT and can also display JPG for example). Many image viewer and converter for DOS can still be found, see "related link". Spinrite is a hard drive diagnostic software, and was first published in 1987. The last version 6.0 was published in 2004. Before I go on with my explanations, remember, Spinrite should be necessary only for MFM and RLL drives, modern IDE drives have their own defect management. Last time I recognized my IBM Portable PC has at least 110KB clusters marked as bad. But I didn't expirienced problems so far (read or write errors), so I was happy. But even 110KB are space which you could need, so I decided to "refresh" the 20MB MFM hard drive with Spinrite II. After 4 hours only 15% were processed, so I decided to stop it with pressing ESC, which is NOT a hard break, Spinrite finishes it's last action (last processed cluster). Now I tried to boot again and guess what, NOW I had read errors. Also, the drive seeks desparately for a readable sector often. CHKDSK results in 250KB bad clusters. This was surprising for me first, because BEFORE I started Spinrite, there was no noticeable error ! Also, I got many defective directory entries, which I could NOT REPAIR with CHKDSK /F. But meanwhile I understood what happened. For such an old MFM hard drive, this is a torture or at least stress. So instead of doing something good, I tried to kill my MFM hard drive. If in doubt about the drive health, you may use a DOS 6.2 (6.22) boot disk with SCANDISK, to detect unreadable clusters. I recommend NOT TO USE Spinrite, because your old drive will hate you for it. Believe me. 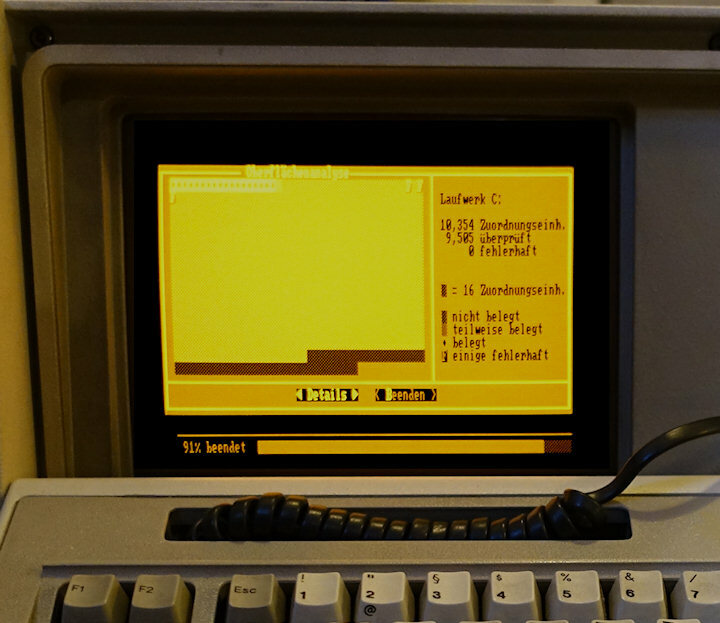 SCANDISK should be called with the parameter /SURFACE and for monochrome screens with /MONO, too. This Portable PC is heavy, but it's an IBM PC/XT in a case with a build in amber CRT screen. 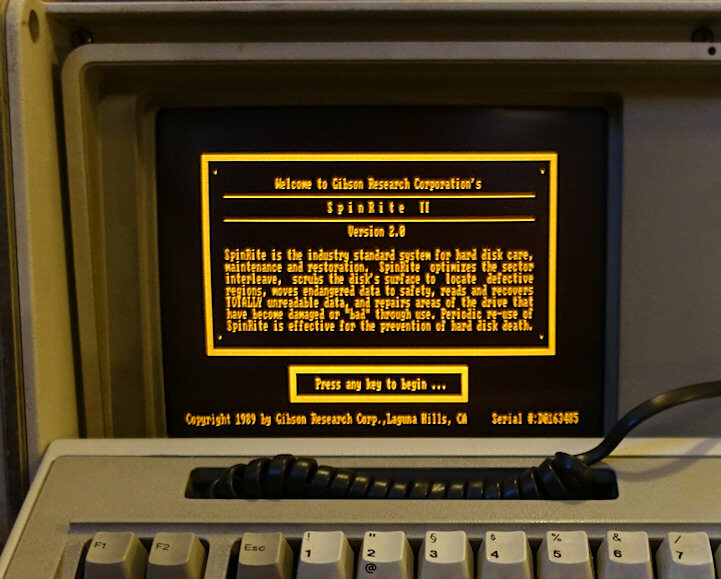 It's factory configuration only includes 256KB RAM, an IBM PC floppy controller and a CGA graphics card. The internal screen is feed by an FBAS (Composite) video signal (and not with 9-pin connector). An original 64-256KB memory card was installed, which results in 512KB in total. 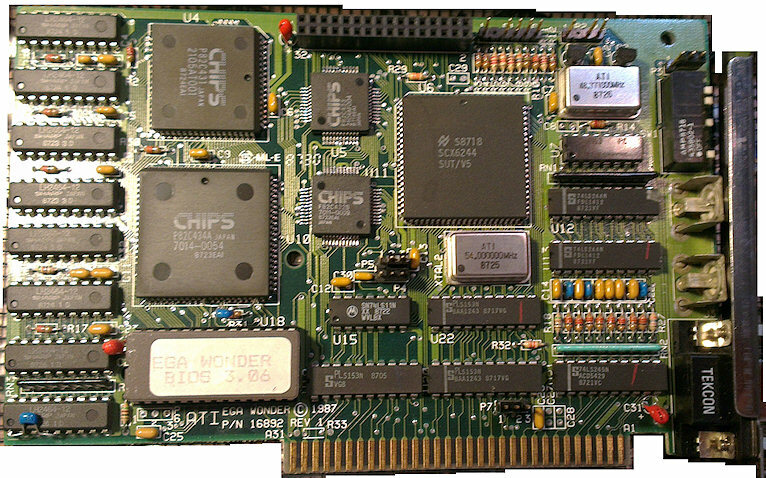 But I managed to add interface cards, and I replaced the original memory card with a Mycomp MEMS memory card, which can be populated with gigantic 2048KB RAM, and this card can offer conventional *and* expanded memory (at the same time). 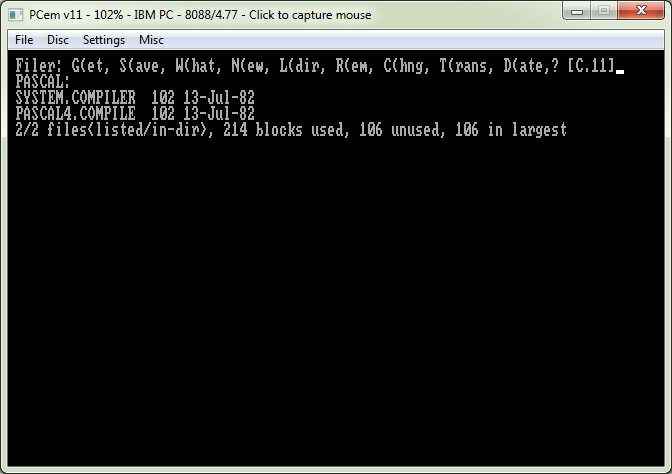 In the screenshot, you can see the result after it was booted (IBM DOS 5.02 is used). Believe me, repairing or just changing the cards, DIP switches or memory chips on the mainboard is *NO* fun. Inside the case it's really (over)crowded. But on the other side, in terms of mechanical quality, this PC seems to be very good quality. Take a look at the 'related link' below, if you are interested in further details.